Quality friendships have the potential to give us feelings of compassion, belonging and happiness. They can help improve our sense of self-worth and help us cope. When you have a mental illness, you may think that your friendships are bound to be more complicated. You may even deem healthy relationships impossible. But it’s very important to dispel the internalized stereotype that your relationships will suffer because of your mental illness. Friendships can flourish despite a diagnosis. There are many reasons why friendships fade, and your condition will not always be the cause. Despite what you see on social media, all relationships experience ups and downs. And there are ways to work through and navigate issues that might come up over time. It’s important to know and understand your diagnosis, but also bear in mind that you are a unique person. Mental illness manifests differently based on the individual, so it can be helpful to know your specific symptoms, triggers and warning signs. Having this awareness gives you insight into how your condition can impact your friendship. For example, could your condition cause you to misinterpret social cues? Or prompt anxiety when you see your friend with another close friend? Preventative knowledge can empower you to effectively manage your emotions. If you are aware of your triggers, you may be able to catch your reaction in the moment and evade a miscommunication or a conflict. Even if you aren’t aware of your reaction when it happens, after reflection you can approach your friend to clarify, apologize or discuss how to handle similar predicaments in the future. Friends may trigger your symptoms, despite their good intentions. For example, your friend may want you to meet their new friend and invite him/her to a coffee date with you without asking. If you live with an anxiety-related diagnosis, specifically social anxiety, this seemingly harmless and kind gesture by your friend may actually trigger your anxiety. If you assess that your friend is trustworthy, compassionate and reliable, you may choose to openly discuss your mental illness. Also, if they know about your condition, they may be able to help you with your self-care or notice warning signs. Talking openly about your condition could help both of you establish a deeper bond as well as a new layer of support. All friends need support at one time or another. Even if your friend does not have a mental illness, there will be times you can provide support as well. Helping others is shown to make people happier and can even help reduce symptoms. If your friend does have a diagnosis of their own, this similarity could bring you closer together; you can each discuss your symptoms and try coping mechanisms together. For example, you could attend a support group together or help each other seek therapy. If you need more support than you are receiving, step back and consider whether the level of care you need is something a friend can provide. Because you have an established connection with your friend, you may feel comfortable leaning on them. However, it is important to recognize that your friend cannot be your therapist. Question if you need more support from a friend or from a mental health professional. Mental health and relationships can influence one another. And while friendships can be challenging when you live with mental illness, they are ultimately worth the effort. 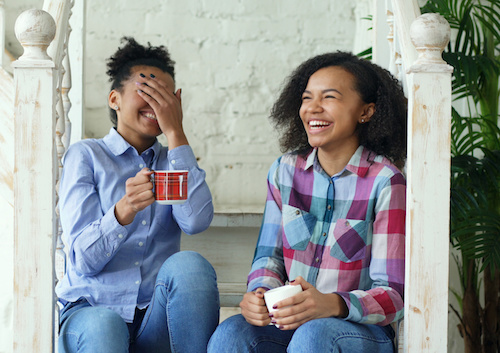 Investing in healthy friendships is a powerful way to help you along your mental health journey. Shainna Ali is a mental health practitioner, educator, and advocate. She recently authored The Self-Love Workbook and is the owner of Integrated Counseling Solutions, a mental health counseling and consulting practice in Downtown Orlando. Beyond the counseling couch, Dr. Shainna enjoys contributing to NAMI to help promote mental health awareness. For more information on Dr. Shainna, please visit www.ShainnaAli.com.